Mmmmm. Sony Chumby! Don't know? Google Chumby. Do want! Needs Hulu tho. Sony Dash ready to hit the market: "
Back at CES 2010 we saw that Sony unveiled the Dash during their press conference, and while this was never going to be a game changer of any kind, it was still nice to see yet another touchscreen device ready to hit the market. 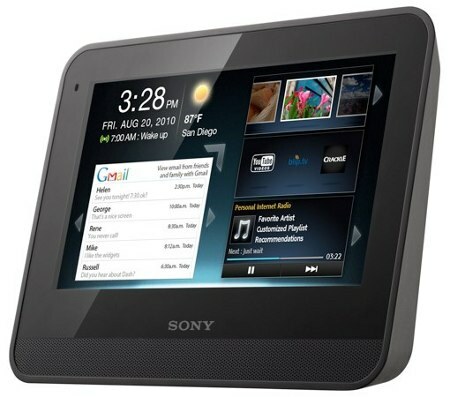 Well, a good 4 months or so has elapsed since then, and it is finally good to know that Sony will be introducing its Dash Wi-Fi touchscreen device to the market at last, where you are able to receive real-time, personalized Internet content that is pushed to you regardless of whether you are at home or at the office. The Sony Dash has been tagged with a $199 price tag, where you can purchase it online from SonyStyle.com or pick it up from other Sony Style retail stores and authorized dealers nationwide. You get a 7″ color touchscreen display to view all the relevant information being shown, where the Dash will rely on a current wireless internet connection in order to receive a continuous display of your selections from more than 1,000 free apps, where many of them are offered via Chumby Industries, Inc., where among these include news, calendars, weather, sports, and social networking. Not only that, with the use of BRAVIA Internet Video, the Sony Dash is able to let you be entertained via TV episodes, films and additional video content and music from a host of other providers such as CBS, Netflix, YouTube, Pandora and Slacker amongst others. You will be pleased to know that the Dash will boast a playlist of your own personalized internet world which is constantly refreshed and pushed to you, hence helping you save time since there is less need to search for your favorite content or to log onto your favorite sites. Apart from all of the above mentioned, the Sony Dash also doubles up as an alarm clock, letting you wake up through your favorite music videos, internet radio or other video content instead of the standard alarm clock buzzer which is old hat by now. Nice to know that multi-tasking is also supported, which means you can refer to a recipe in the kitchen while having some MP3 files playing in the background.